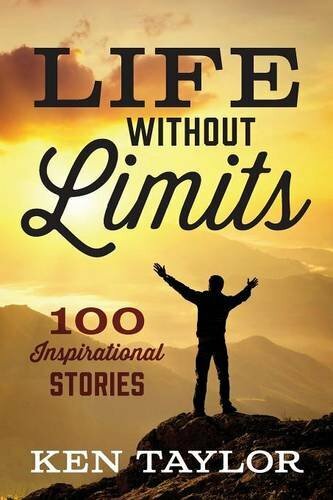 “Life Without Limits” by Ken Taylor contains 100 short inspirational stories inspired by real people. Some of the stories are about celebrities whose names we all recognize, others are about little known people who have made a significant impact on those around them. The author even has one for himself. There are some very special people mentioned that passed on way before their time, yet in their short lives, still managed to make a difference and be remembered long after their deaths. I found this book to be very thought provoking. One of the chapters that really resonated with me was, “Spend Wisely,” referring to how we spend our time. It really made me think hard about eliminating “time wasters,” from my life. I think a lot of people can relate to this one! Throughout all the stories I was also reminded about how important it is to be a positive influence for others. Some of the greatest motivators are the people who have had to overcome the most. The author fits well into this category. I would also like to note that Ken Taylor infuses a lot of energy into his writing. As a result of this, readers will find themselves being lifted up and energized! “Life Without Limits” by Ken Taylor should be read by people who want to learn how to live without having anything hold them back. No limits. While I read it in a couple of sittings, it would be a terrific book in which you read one chapter a day and journal your thoughts about it. There is so much valuable advice in these pages! I plan to go back and start journaling. This book would also make a great gift for others. It would be perfect for family members and co-workers. I think that all who really read it, and incorporate what they learn into their lives, will find themselves evolving. You won’t be just giving someone a gift, you will be giving them something meaningful to treasure for years to come.